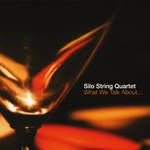 What we talk about... / Silo String Quartet. What we talk about when we talk about love / Caerwen Martin. What we talk about when we talk about love is a string quartet written for my friend and collegue Ceridwen Davies. The piece is based on converstations we have had over the years and also references the novel, what we talk about when we talk about love by Raymond Carver. The work is sectional and emotionally driven, exploring the different states of love like bliss, insecurity and tension. 28 Jun 15: Walker Street Theatre. Featuring Silo String Quartet.